Here’s one of my best tips for enjoying your hike of the John Muir Trail: sit down every once in a while! For the next several posts I’m going to list some of my favorite spots to drop my backpack and take in the surroundings. Some will be great places to camp, others will be a great place to take a break, take a picture, or, perhaps, take a nap. Top of Nevada Fall (~ 3.3 miles from Happy Isles) Map: I always take my first significant break of my hike at the top of Nevada Fall. I can’t think of a better place to pause, refresh, and regroup. By the time you reach the bridge over the Merced you will have ascended to almost 2,000 feet above the valley floor. If you’re stopping at Little Yosemite Valley, it means you’ve knocked off almost all of the climbing for the day. The views from either side of the bridge (be sure to explore both) are amazing, the granite is flat & warmed by the sun, and, of course, the Merced surging over the lip of the fall is something to see. There will normally be a dozen or more day-hikers in the area, who have either reached their goal for the day, or are heading on to the top of Half Dome. Enjoy their company; you’ll not see their likes again for a few days. Sunrise High Sierra Camp (~13.9 miles from Happy Isles) Map: it’s not the view that recommends this spot, it’s the potable water and the companionship. Spend an hour or two here and I can almost guarantee you that someone interesting will pass by and start a conversation. Perhaps it will be a Ranger, a worker at the camp, or a fellow hiker. Regardless, they’ll have the latest skinny on what is going on in the area. Upper Cathedral Lake (~3.6 miles from Sunrise Camp) Map: this is one of my favorite spots on the entire trail. 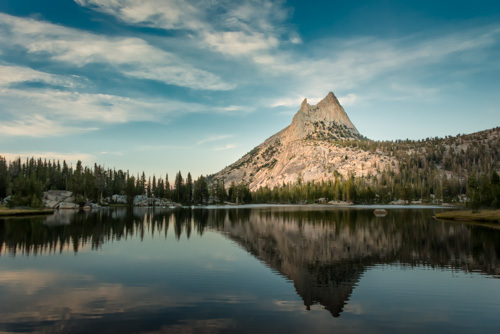 The views of Cathedral Peak are terrific, and the lake itself sports a granite peninsula that juts out into the water like a pier. There are good camping grounds on the south and west sides. My recommendation is that you spend the night here, even if it means you camp early. A few hours exploring the lake will be time well spent. If you can’t stay the night, I’ve always found the serenity of the place perfect for a midday nap. Lower Cathedral Lake (~1.5 miles past Upper Cathedral Lake) Map: this is a little more than a half mile off the trail, but it’s worth an extra few steps. If you decide you must get a little past the upper lake, consider stopping here instead. Tuolumne Meadows (between 21 and 24.6 miles from Happy Isles) Map: cheeseburgers, fries, resupply, plumbing, and a night on a mattress if you’re so inclined. Need I say more? Lots of Places Along the Tuolumne River in Lyell Canyon: if there is a single stretch of the John Muir Trail that stands out above all others, this is it. You will climb so slowly that you hardly notice and your constant companion will be the river. The great places to stop are almost unlimited, but my favorite is here. The lake just below Donohue Pass (~7.5 miles from Tuolumne Meadows) Map: perched at the edge of the tree line, this little lake is a fabulous place to spend the night. Avoid the illegal campsite near the water and instead turn east and explore the higher ground. In the morning, cross the outlet stream to continue on up to Donohue Pass. Rush Creek Drainage (~between 1 and 3 miles south of Donohue Pass) Map & Map: after the monumental scenery of Yosemite, the more subtle beauty of the Rush Creek drainage is a welcome change. Countless brooks and streams meander through short grass, all dotted with granite and stunted trees. It’s has all the feng shui of a well-tended Asian garden without a single gardener. The first portion is great for breaks; the latter portion better for camping. Cathedral peak and lakes are my absolute favorite spots as well. What I have discovered most of all though when climbing is to stop and turn around. Most often the sites are spectacular and if I didn’t take the time to stop and turn around for a look, and to catch my breath, I would have missed that “wow” moment. Great tip, Diane. This is especially true coming off the passes! Thanks. I will add one additional note regarding the top of Nevada Fall. I’ve been up there over 30 times on various backpacking trips throughout Yosemite and the Sierra Nevada. The top of that fall seems to attract the worst of humanity. – a group of kids who thought that “tagging” the area with spray paint would be fun. – a mother who thought it was acceptable to change her childs diaper, and then leave the dirty diaper sitting on the rock. – a group of 20 high school students, all yelling on their cell phones at the same time. – someone who bought a bluetooth speaker with them, so everyone could enjoy their gangster music. Seriously….do yourself a favor, get an early start, and you’ll have the whole place to yourself! I haven’t had such bad luck, Kathy, but I certainly agree that the conduct is atrocious. I have seen unsupervised children WAY too close to the edge, though. Criminal. I’ve seen unsupervised children quite a bit at Glacier Point too. As a parent, I cringe every time I see that.